New Delhi, India, April 21, 2015 – LocalCircles (https://www.localcircles.com/a/), India’s leading Community Social Media network today announced that it has recently concluded a large community poll on the performance of first year of NDA Government. With approximately 25,000 citizens responding to each one of the 8 poll questions, this poll provides collective citizen pulse on state of things, the progress made in the last year, what is working and what needs action. LocalCircles had also conducted a poll on 100 days of the Government. Interestingly, some ratings including engagement of the MP with constituency were similar indicating that the MPs despite the findings from the 100 day survey, have not engaged more effectively at the constituency level. Citizen rating of Government’s commitment/actions towards Fighting Corruption has dropped from 61% to 47%. Citizen evaluation of Government commitment towards Improving Women Safety and Tackling Communalism in the 1 year poll is also slightly lower from the 100 day poll. Both, Fighting Corruption and Addressing Women Safety were listed as 2 of the 3 top Government priorities for 2015 identified by the LocalCircles India Governance and Development community with 200,000 citizens. The third priority was Energizing and Empowering Bureaucracy to deliver on the big promises made by the Government in 2014. Strong actions remain to be seen on all these fronts. In a separate poll, recently conducted by LocalCircles in its 250,000 strong Swachh Bharat community, citizens indicated positives of the Swachh Bharat Mission being awareness creation but also highlighted that only very local few civic bodies are engaged in the mission and with the citizens and that is dampening the momentum of Swachh Bharat. 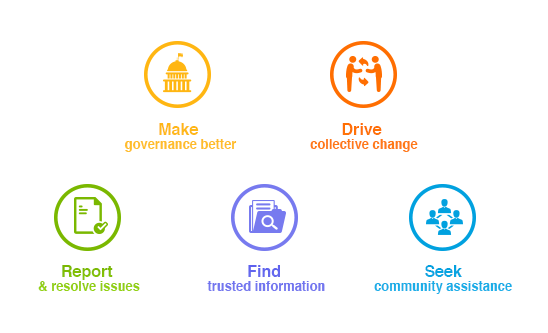 The localcircles governance communities have so far created more than 100 whitepapers and checklists on India’s governance and development across a variety of areas and have submitted them to the PMO and Ministries.